The exuberant explosions of old college days have traditionally been forgiven as somewhat enviable expressions of the high spirits of exultant youth. Are young intellectuals, now the dominant group in many colleges, less adolescent and more mature, or do their immaturities merely manifest themselves in different ways? As intellectual individualists, students do not usually care for group explosions unless they are for social causes such as the rights of minorities. But their adolescence often manifests itself individually in a superior condescension or in depressive inferiority complexes. This book is a fascinating account of the changes that have taken place in the backgrounds, attitudes, and, temperaments of students at the so-called prestige colleges. 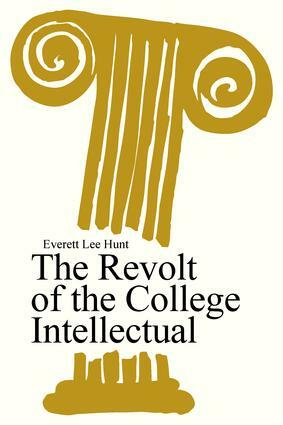 Though Everett Lee Hunt draws heavily upon his observations and experiences during more than thirty years as a dean and professor of Swarthmore College, his book is much more than a case study of one outstanding college. Hunt presents many concrete examples of student moods, customs, actions, and expressions of values. With wisdom and warmth he discusses three successive eras in the college schooling of American adolescents: guarded education, conformity to accepted ways, and intellectual individualism. Teachers, deans, student counselors, personnel workers, and school psychologists and psychiatrists will find this classic book of continuing interest in guiding their dealings with adolescent students. The Revolt of the College Intellectual may also interest students themselves, their parents, alumni, and all who are in anyway concerned with education as a preparation for life in a rapidly changing and troubled world.